With two years of -20+ weather I thought I’d give a quick run down on how to get free heat! Last year and this year the polar vortex hit SW Ontario and in my passive house designs the furnace wasn’t running! In fact chocolate was melting on my counter! How is that possible? Careful thought at the very beginning of building design and some free heat from the sun! Melting chocolate at -15 degrees outside AND the heat is OFF! The sun is a powerful heat source if you know how to control it and work with it. Too many new build designs I see being constructed completely ignore the site and orientation of their building. There are many factor to consider when siting your house or building, but Sun and Wind should be high on the priority list! The road, laneway, access and front door are important, but none of them will reduce your heating costs! By simply aligning the majority of windows towards the south sun, you can significantly cut your heating bills. The first year in our passive house was a dreary, cloudy winter, so we filled our propane tank twice. However the following two years have had a winter scattered with sunny days and we’ve only filled our tank once (and didn’t even come close to emptying it!). And during the coldest week of the year our furnace didn’t run 3 days of the week as the sun did all the work! 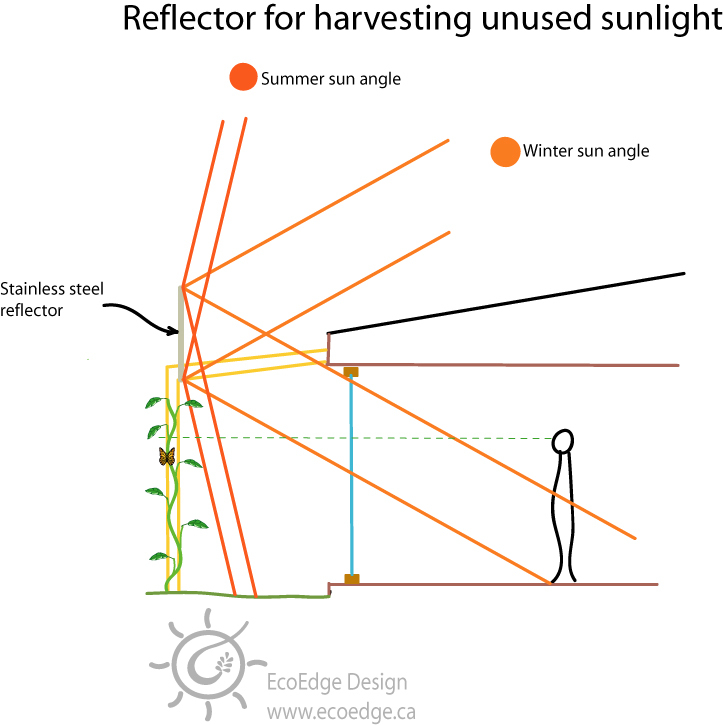 I’m sure many of you are thinking, but your summer’s must be unbearable with all the sun shining in, but alas, if you carefully consider the angle of the sun in the summer being high, you can use an overhang/trellace/or trees to completely eliminate any direct sunlight and heat gain during the summer. A few other considerations when trying to capture the sun’s heat are heat sinks, these are materials that are efficient at collecting and storing sunlight and heat. Such as concrete, tiles, stones, water, etc. Imagine in the spring on a cool but sunny day, the rocks or concrete benches are warm as they collect the heat and then slowly release it into the cold air, or directly to your touch. The same principle can be used to collect and store sun heat in your home. The overhang depth over this porch protects the south windows from direct sunlight and heat gain from April to October! You should also carefully access the Solar Heat Gain Co-efficient (SHGC) rating of your windows. Many windows these days have coatings to reduce the solar heat gain that comes through your windows. This is great for south windows in the summer that do receive direct sunlight, but if you protect your windows with overhangs, and want more heat to come in the winter, lower co-efficient or eliminate coatings can be very useful. This should be carefully design with your architect and window supplier. VELD architect can help you site your building to take advantage, and then following through with the necessary insulation, air tightness, and construction methods to make your house low energy!